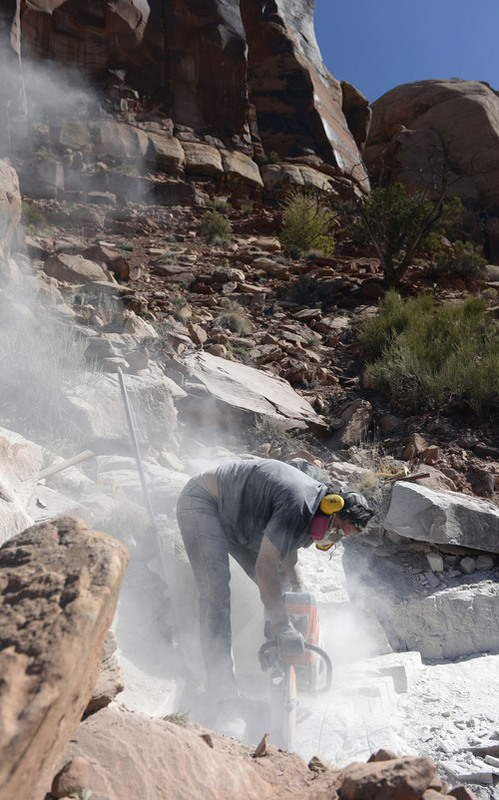 Al Hartmann | The Salt Lake Tribune Natural History Museum of Utah prep lab manager Tylor Birthisel cuts through sandstone with a rock saw to remove rock to get down to an aligator-like fossil embedded in the sandstone cliffs near Canyonlands National Park. 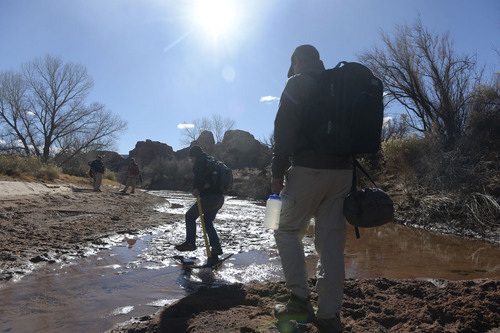 Al Hartmann | The Salt Lake Tribune Volunteers with the Natural History Museum of Utah ford a creek with equipment to hike to a fossil site near Canyonlands National Park. 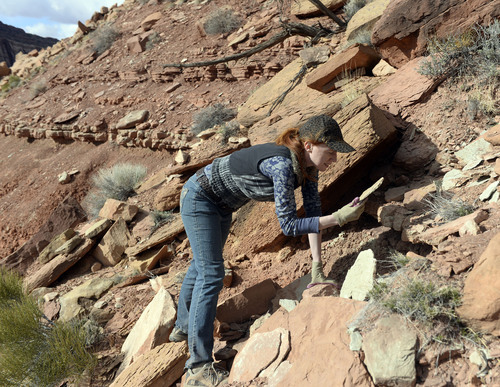 Al Hartmann | The Salt Lake Tribune Natural History Museum of Utah volunteer Melinda Hurlbut turns over rocks looking for fossils of fish at a promising site in the sandstone cliffs near Canyonlands National Park. Al Hartmann | The Salt Lake Tribune Staff and volunteers with the Natural History Museum of Utah work high in the cliffs near Canyonlands National Park. 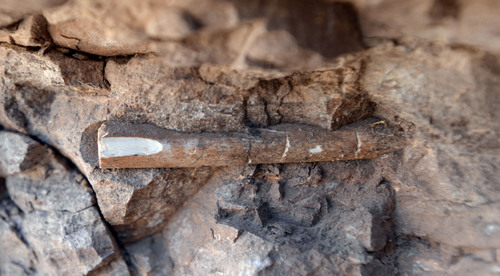 They have to remove about 5 feet of rock overburden with picks, shovels, rock saws and pry bars to get down to an alligator-like fossilized skeleton encased in the sandstone layers. Al Hartmann | The Salt Lake Tribune Lines of a fossilised fish found by volunteers with the Natural History Museum of Utah in the sandstone cliffs near Canyonlands National Park. Al Hartmann | The Salt Lake Tribune Volunteers with the Natural History Museum of Utah look for fossils near Canyonlands National park. 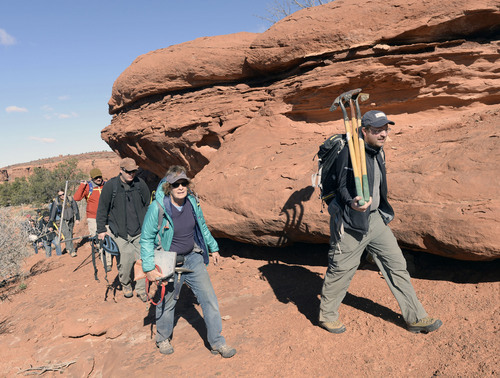 Al Hartmann | The Salt Lake Tribune Volunteers with the Natural History Museum of Utah hike overland with equipment to a fossil site near Canyonlands National Park. 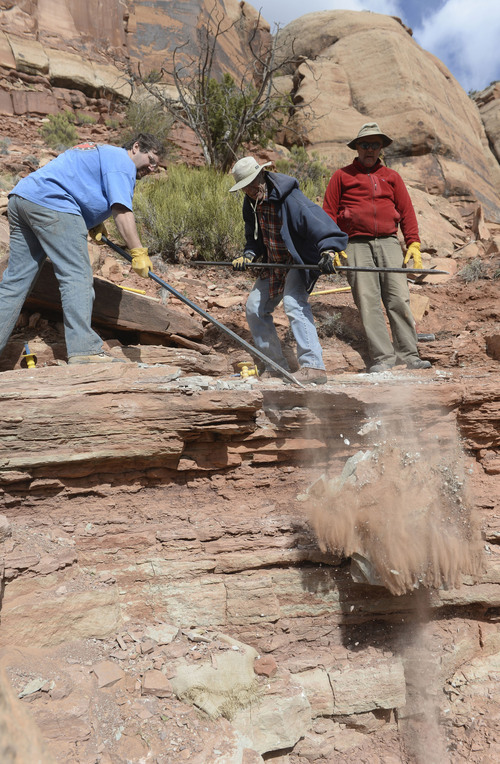 Al Hartmann | The Salt Lake Tribune Possible rib bone of an aligator-like animal being uncovered byNatural History Museum of Utah staff and volunteers in the sandstone cliffs near Canyonlands National Park. Al Hartmann | The Salt Lake Tribune Volunteers with the Natural History Museum of Utah look for fossils near Canyonlands National Park. Al Hartmann | The Salt Lake Tribune Natural History Museum of Utah curator of paleontology Randall Irmis and lab manager Tylor Birthisel prepare a plaster of paris cast to protect an exposed piece of an alligator-like fossil embedded in the sandstone cliffs near Canyonlands National Park the museum and volunteers are excavating. 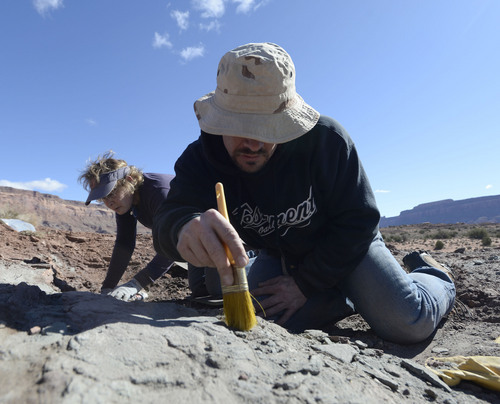 Al Hartmann | The Salt Lake Tribune Natural History Museum of Utah volunteers Jeanettte Bonnell and Erin Finney carefully remove overburden with brushes looking for fossils of fish at a promising site near Canyonlands National Park. 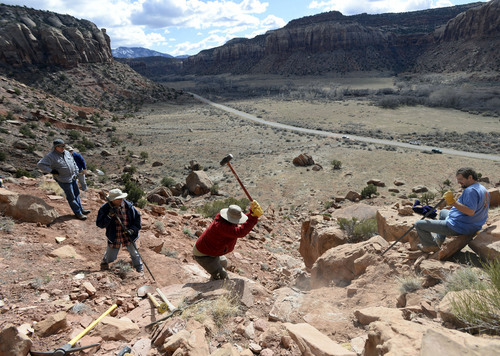 Al Hartmann | The Salt Lake Tribune Natural History Museum of Utah staff and volunteers work to remove several feet of overburden to get down to an aligator-like fossil embedded in the sandstone cliffs near Canyonlands National Park. A piece of the exposed fossilized skeleton is protected with a plaster of paris cast to protect it during excavation. Al Hartmann | The Salt Lake Tribune Volunteers with the Natural History Museum of Utah look for fossils near Canyonlands National park. 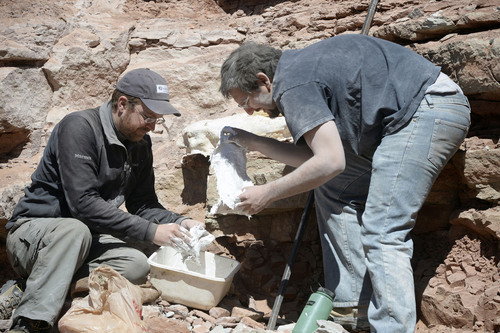 Al Hartmann | The Salt Lake Tribune Natural History Museum of Utah curator of paleontology Randall Irmis sweeps off an exposed fossilized skeleton protected with a plaster of paris cast during excavation. It is an aligator-like fossil embedded in the sandstone cliffs near Canyonlands National Park the museum and volunteers are excavating. Al Hartmann | The Salt Lake Tribune Lines of a fossilised fish found by volunteers with the Natural History Museum of Utah in the sandstone cliffs near Canyonlands National Park. San Juan County • Jeanette Bonnell likes to play in the dirt. The 62-year-old retired human resources specialist is also pretty handy with a dentist&apos;s drill. Those two qualities, combined with fine attention to detail and a little detective work, make her the perfect volunteer for the Natural History Museum of Utah&apos;s paleontology department. 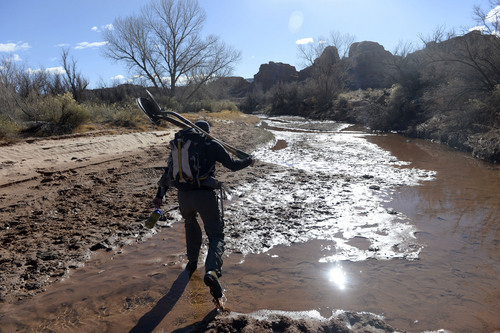 "I worked for 30 years behind a desk and when I retired, I said no more," Bonnell said while whisking away layers of dirt deposited in an ancient pond 300 million years ago in a remote location just outside what is now Canyonlands National Park. "The experience of finding your first fossil is indescribable." 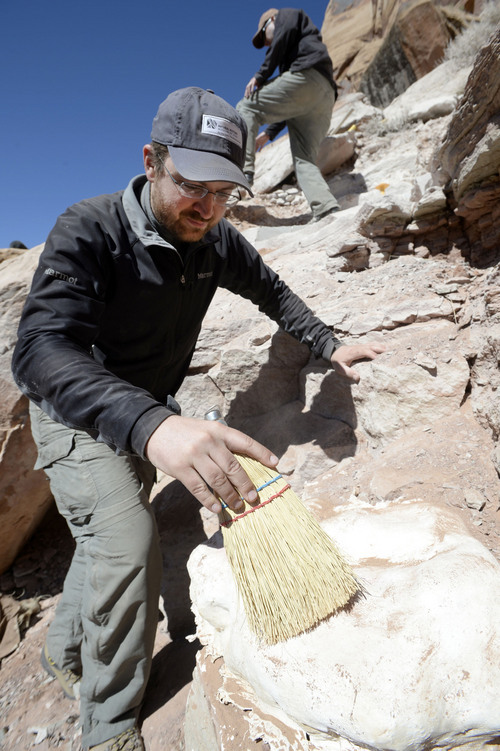 Paleontologists come from around the world to a Utah landscape rich with bones of ancient creatures, but not everybody doing the digging, cleaning the fossils and even making the discoveries has a fancy title in front of their name. "We have amazing volunteers. 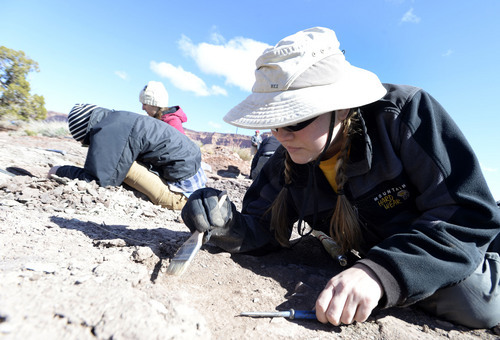 They discover fossils, they excavate fossils and back in the lab they prep them out," said Carrie Levitt, paleontology collections manager at the Utah museum, during a dig in April. "We would not be able to do the work we do as paleontologists without the volunteers." Digging dinos • As a kid, Erin Finney loved visiting the museum in San Francisco&apos;s Golden Gate Park. He was particularly fascinated with the dinosaurs. So it is no surprise Finney ended up being the one who children visiting the Natural History Museum of Utah now dream of becoming when they grow up. "What kid doesn&apos;t love fossils?" said Finney, a seasoned volunteer in both the prep lab and on field trips with the museum&apos;s paleontology department. Five years ago, Finney was walking with a friend through the museum at its previous location on Presidents Circle at the University of Utah. They looked through the windows into the lab  the one with a "Employees and Volunteers Only" sign on the door  while people prepared specimens from the field with delicate tools and magnifying glasses. "She turned to me and said, &apos;You belong here,&apos; " Finney said. "I guess I do have an affinity for working in the lab and finding things." Last year while scouting possible dig sites in San Juan County, Finney found an important discovery on a steep slope. "There was about 200 square yards I knew we had not prospected yet; a chunk of the map we had not looked at," Finney recalled. "I found one fish and then another and another and another." With so many fossils in the same area the team refocused its efforts like crime scene detectives. Their efforts paid off when what appears to be the snout of a phytosaur  a crocodile-like creature  was discovered sticking out of the cliff. On the same trip Finney stumbled upon half of a limb bone of a hadrosaur, a duckbill dinosaur. He then spent hours looking for, and eventually finding, the other half of the bone. "I didn&apos;t know exactly what it was at the time, but I knew it was good," he said. &apos;They belong to us as Americans&apos; • The Beehive State provides a plethora of fossils and is well known among paleontologists. 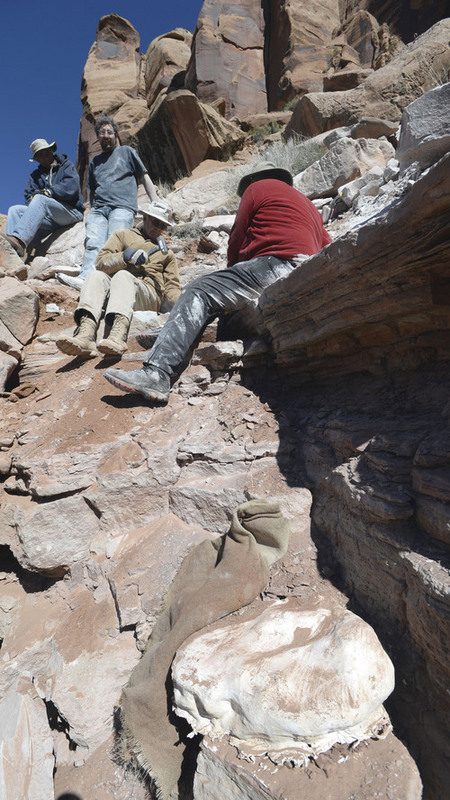 "Utah is the best place in North America to find fossils of almost any age," Randy Irmis, paleontology curator at the Natural History Museum of Utah, said while working with volunteers at the ancient pond site. 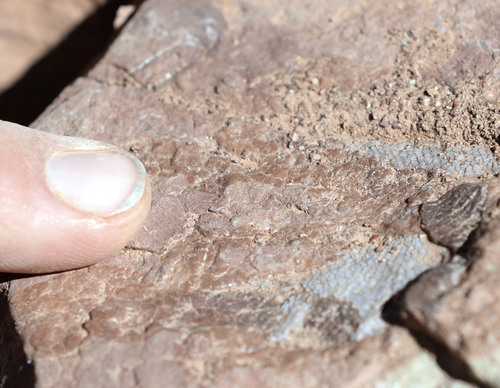 "We are really interested in what life was like 300 million years ago in Utah. This is one of the few sites that has a lot of different animals preserved and we can get a really good sense of that." Sometimes finding dinosaurs only requires paying a little bit of attention while exploring Utah. But taking them home is against the law. Utah&apos;s fossil history "ranges from the beginnings when we first started to see invertebrate fossils all the way to mammoths and everything in between," said ReBecca Hunt-Foster, a Utah Canyon Country District paleontologist for the Bureau of Land Management (BLM). "But in 2009 a law was passed to protect paleo resources and all vertebrate fossils," she said. "If you find those, don&apos;t collect them." Irmis and Hunt-Foster say people who discover fossils on public lands should report their findings to the BLM or a museum. 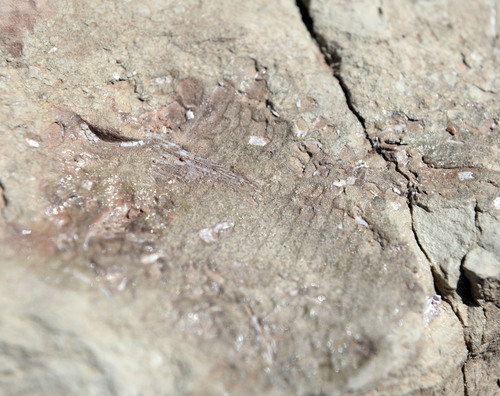 The Natural History Museum of Utah is "permitted to collect fossils on public lands, but they are not the property of the museum," Hunt-Foster said. "They hold them for everyone; they belong to us as Americans." The museum, along with other similar museums, is a repository for such collections. Researchers from around the world are invited to visit and study fossils. A &apos;connection you can&apos;t describe&apos; • Discoveries don&apos;t only happen in tucked away locations. Fossils found in the field are collected  in many cases, wrapped in a plaster cast still surrounded by dirt and rock called matrix  and sent to the museum. In the prep lab, volunteers and museum staffers wear lab coats and use dental tools such as drills and picks to clean off the fossilized bones. "There are discovery aspects in the lab," said Bonnell, who started as a gallery interpreter at the Natural History Museum of Utah, earned her way into the lab and then was invited on field trips. "We slowly take the layers of matrix down and you start seeing little bits of bone. It&apos;s an awakening process. All of a sudden you have this fossil. There is some sort of connection you can&apos;t describe, but it is there." Finney, who has spent the last nine or so months working on the same ichthyosaur skull, admits the lab work can be tedious, but he also likens it to art. "I look at it like subtractive sculpture," he said. "They say rock will dictate the sculpture. In the case of fossil prep it is quite literally what the bone will look like when you take the matrix off of it." Finney says getting a new plaster cast is like "getting a Christmas present that takes a really long time to open." Finney and Bonnell both like to take breaks from the lab and walk around the museum. They are constantly rewarded by seeing young people, and those not so young, staring at the bones of ancient animals they helped reconstruct. Now that she has worked in the lab and the field, Bonnell can explain how the dinosaurs ended up at the museum. "Some of those kids know more about dinosaurs than I do," Bonnell said. "But they look at me a little differently when I tell them I found some of the items on display." Visitors will notice little plastic replicas of dinosaurs resting on or near many of the items being worked on in the prep lab. It&apos;s a way of reminding the volunteers about the unique animal they are working to reveal. It is a custom Finney has incorporated on a shelf at his home. "Every time I work on a different taxon of different species I buy a plastic toy of that genus," he said. "So far I have seven little plastic dinosaur toys. Hopefully, I will add an eighth sometime soon." Staffing at the Natural History Museum of Utah is augmented by volunteers in every department. Spots in paleontology are popular and not always open so check the website  http://nhmu.utah.edu/volunteers  for a chance to become a dinosaur digger. The museum is now recruiting volunteers for visitor services and for an upcoming exhibit, "The Horse."